In the wake of the Pixel madness yesterday, Asus and Verizon have announced the ZenFone V, a mid-tier phone exclusive to the Big Red carrier. For $384, or $16/mo for twenty-four months, you get a decent little device with yesteryear's high-end specs. I actually have a ZenFone V on my desk right now, and I have to admit that it's a nice little device. The "Sapphire Black" color is absolutely gorgeous — the render above actually captures the effect quite nicely. The phone itself is light and performs very well. My only disappointment thus far is that it's running Nougat 7.0, but at least it has the newer, less offensive ZenUI on board. The ZenFone V is available right now from Verizon (online or in-store) at the source link below. 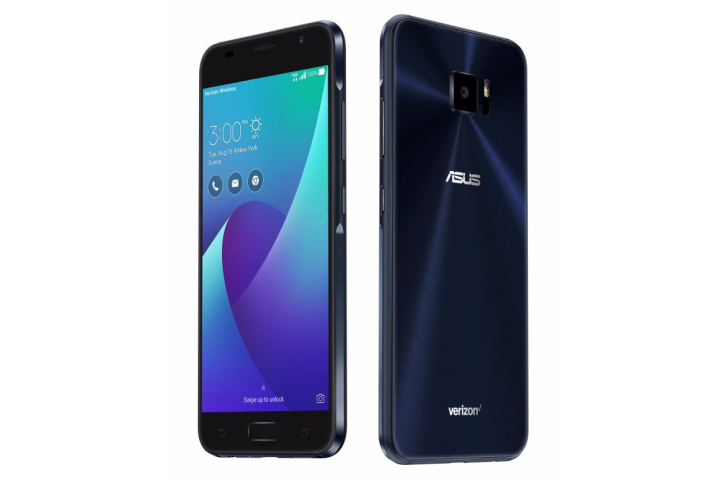 FREMONT, Calif.--(BUSINESS WIRE)--Today, ASUS announced the immediate availability of the ASUS ZenFone V exclusively from Verizon. Available for $384 retail or on Verizon device payment for $16/month for 24 months (0% APR), the ASUS ZenFone V is an excellent value in the mid-tier smartphone market and features a 5.2” Full HD AMOLED display, a dual-sided 2.5D curved glass design, a top notch camera using a 23MP IMX 318 image sensor, and a Qualcomm® Snapdragon™ 820 processor. The ASUS ZenFone V, with its Snapdragon™ 820 SoC featuring an Adreno™ 530 graphics engine, brings an extra level of performance to the mid-tier segment, providing more graphics capabilities that result in smoother experiences when gaming, multi-tasking, and performing other demanding tasks. The ASUS ZenFone V is also outfitted with 4GB of system memory, making for snappy OS experiences and minimal app reloads, ensuring that apps load immediately when called upon, and comes with 32GB of system storage, expandable by up to 256GB with the use of a Micro SD card. The ASUS ZenFone V features a brilliant 5.2” Full HD AMOLED display, and is covered in curved 2.5D Gorilla Glass not only on the front, but also on the back for a truly premium looking design. The ZenFone V is also a great option for those valuing photography, employing a 23MP Sony IMX 318 image sensor, laser auto-focus, and 4-axis optical image stabilization to deliver instant, crisp and detailed shots in all situations. The ASUS PixelMaster camera features full manual controls in addition to special modes such as HDR, Low Light, Super Resolution, Beautification, Depth of Field, Panorama, GIF Animation, and more. The 8MP selfie camera is also class-leading, producing clear video chats and images ready for sharing. The ASUS ZenFone V comes loaded with technologies typically found on flagship-priced models, including a NXP Smart AMP to provide more expansive sound and higher volume, support for Hi-Res Audio and DTS Headphone:X, 4K video recording, and fast-charging support of up to 18W using USB Power Delivery. Using the included or a supported quick-charge, the 3000mAh battery is capable of being re-charged to 60% in just 39 minutes. The ZenFone V also features the newest USB Type-C port while retaining a 3.5mm headphone jack. The ultra-reliable and responsive ASUS ZenFone V runs on Verizon - America’s largest and most reliable 4G LTE network. The ASUS ZenFone V is immediately available for purchase online and in Verizon Wireless retail stores for $384 retail or on Verizon device payment for $16/month for 24 months (0% APR).